These boilers consume pellets, ecological and renewable fuel, that does not contribute to the greenhouse effect. They are capable of auto feeding themselves, being calibrated to maintain a preestablished temperature or automatically turn themselves on or off at a predetermined time. Energy contained in pellets is high compared with its low price. Stoves and boilers save up to 40% related to a gasoil boiler. Energy contained in pellets is high compared with its low price. Our pellets stoves and boilers produce the same comfort, saving up to 40% from the consumption of a diesle boiler. To use biomass as fuel is an ecological alternativa, then you use forest residues, decreasing so the risk of fire in the forest, and decreasing waste accumulation as well. Sun & Climate offers one of the more quality pellets boilers to find in the international market: Guntamatic biomass boilers. Their potence rank is between 7 and 23 kW, and the adapt very easily to solar and conventional heating systems. With pellets boilers you can reach energy savings of up to 40% of the consumption of a diesel boiler. With this type of boiler, skome doesnt intervene in the 'greenhouse effect'. Besides, our boilers are able to work with a low return temperature, untill 30ºC without producing condensation. Pellets tank has an automatic device of refuelling. Guntamatic boilers are available in different models: comfort, quality, high efficiency and high technical level that they offer are just the same in all the models. The only features that differentiate one from the other is their potence: Biostar only reach to 23 kW, while Biocom is available up 30 kW. The other different feature is the pellets tank feeding: Flex models use a room or carrier to store the pellets,while the others use an external metallic tank, with the exception of Biostar W, that is of low potence and has an integrated pellets tank. • They work with high temperatures, without condensation problems..
• They warranty the maximal security thanks to its differente antifire devices. • They have a monitorized control of the whole processs with a simple and esasy-to-use menu. • Their work with an impulsion temperature of between 38 and 80ºC. • Its combustion varies between 3 and 23 kW, giving the exact heat quantitiy needed, at the right time. Sun & Climate offers 5 different types of Guntamatic pellets boilers, that adapt very easily to the needs of our clientes. This model allows to keep the pellets in a different room to the one of the boiler. This one is the compact model that shows a monovolumen, with boiler and 400 liter tank for pellets. Its the best option for small dwellings. You can choose between two different types of boilers. Boiler is just the same, but the pellets input changes. In Flex models, pellets are in a closed room, a normal room or an old firewood tank. In Box models, pellets are inside a metalic tank. This model allows the pellets to be stored in a different room to that one of the boiler. Inside the tank, a system drives the pellets to the boiler. This allows distances of until20 m between the boiler and the store. Pellets are stored in a metallic tank, that is also placed in a different room to that one of the boiler. The tank has a size of 2x2 m approximately, and a capacity that varys between 5 and 11 m3. There are different systems to heat water, among them pellets boilers. These boilers features the use of wood pellets. 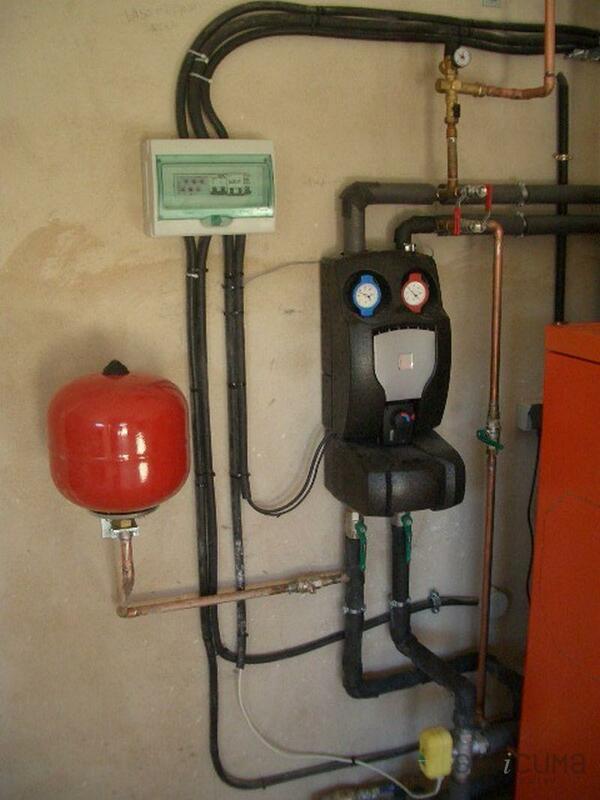 There are many systems to heat water, including pellet boilers. Pellet boilers differ from other boilers by the raw material they use as combustion energy, pellets. Pellets derive from the cleaning waste that the forestry and timber industries produced, which are crushed, pressed and converted to chips. In this particular case the pellet boiler is used for heating and domestic use water. The hot water produced by the pellet boiler is stored in a deposit, its capacity varying, according to the needs. These tanks have independent internal circuitries that allow them to be used for different purposes, as in this case, for heating and hot water. These circuits do not get water from inside the tank, instead, they take the heat, so, there is no mixing between the drinking water with that utilized for the heating.